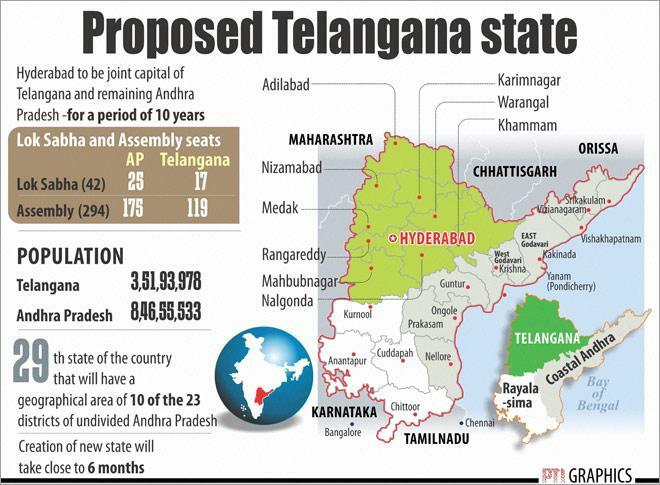 Telangana, as you all know, is the proposed 29th state of India. Telangana is a region in the state of Andhra Pradesh and is going to exist as separate state from 2 June 2014. It is very important to know the history of Telangana and the background of separate statehood demand. 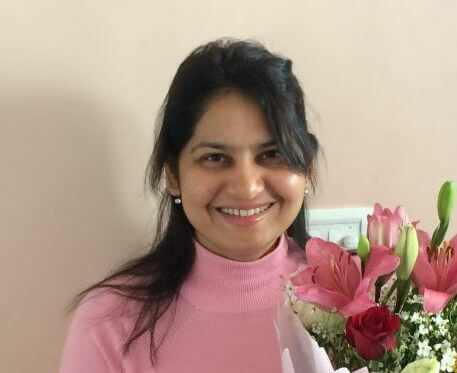 At a time of many statehood demands, Telangana issue is among the most probable areas from which questions can come for UPSC interview this year. 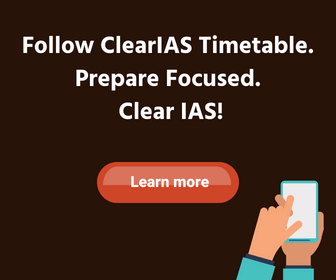 As the matter deals with the federal structure of India, the topic is important for IAS prelims as well as mains too. Telangana was for a long time part of the erstwhile Nizam’s princely state of Hyderabad. But in 1956 Telangana region of Hyderabad State was merged with Andhra Pradesh state. From 1956 to 2014, Telangana existed as part of Andhra Pradesh. The region accounts for 119 seats of 294 in the assembly of AP and 17 Loksabha seats out of 42. Andhra Pradesh Reorganisation Act, 2014 commonly called Telangana Bill is an Act of Indian Parliament proclaiming the bifurcation of the Andhra Pradesh state into two states, Telangana and residuary Andhra Pradesh. The Bill was rejected by Andhra Pradesh Legislative Assembly on January 30, 2014, but was passed in the Lok Sabha and in the Rajya Sabha and got attestation by the President of India, Pranab Mukherjee. 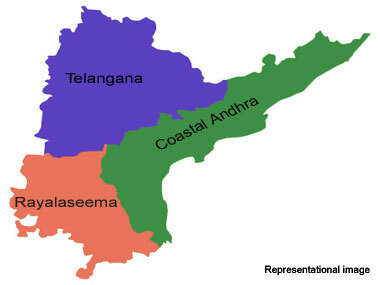 Seemandhra is used to refer to the joint regions of Rayalaseema and Coastal Andhra(Costandhra) in Andhra Pradesh. Most of the area is void of industries and central government establishments. The term came into wide use during the Telangana movement, as a way to refer to the parts of Andhra Pradesh that would remain if the Telangana region separates from the state. It is not easy to cover the entire Telangana-Andhra issue in a single article. It has multiple dimensions, social, political, economic and historical. This is a humble attempt to touch only a few important points. About the name: The name Telangana is believed to have been derived from the word Trilinga Desa. Telangana region is flanked by three ancient Shiva Temples at Srisailam, Kaleswaram and Draksharama. About the name : During the reign of the Nizams in Hyderbad, there was both Telugu speaking as well as Marathi speaking areas in the kingdom. The Telugu spoken region was called Telugu Angana to differentiate it from the Marathi speaking areas. History : The region of Telangana has historical connections with Assakajanapada (considered one of the 16 great janapadas of early India), Satavahanas, Vakataka, Vishnukundina, Chalukya, Rashtrakuta, Western Chalukya, Kakatiyas, Qutbshahis and Nizams. Nizam gave Rayalaseema and Coastal Andra regions to the British under subsidiary alliance in 1799 ( which later became part of Madras Presidency) while Telangana region remained with Nizam’s Hyderbad. Telangana Rebellion : Telangana revolt, was basically started to secure a better deal for the peasants who had to face many hardships under the Nizam and feudal lords of that time known as Doras, mostly hailing from the Reddy and Velama community. Telangana rebellion soon became a full-fledged struggle against the Nizam himself and this resulted in the demand of merging Hyderabad with India. Operation Polo : When India became independent from the British Empire in 1947, the Nizam of Hyderabad did not want to merge with Indian Union and wanted to remain independent under the special provisions given to princely states. The Government of India annexed Hyderabad State on 17 September 1948 in Operation Polo. The Telugu speaking people were distributed in about 22 districts, 9 of them in the former Nizam’s dominions of the princely state of Hyderabad, 12 in the Madras Presidency, and one in French-controlled Yanam. Potti Sreeramulu and demand for a separate Telugu speaking state: Telugu speaking population existed in Madras presidency as well as Hyderbad state. Potti Sreeramaulu, a freedom fighter, hailing from Nellore district, led the agitation to carve out a separate state for the Telugu speaking people of that state. State Re-organisation Commission : The States Reorganization Committee (SRC), which had Fazal Ali, KM Panniker and HN Kunzru among others, recommended the formation of Visalanadhra, which would merge the Telugu speaking areas of the existing Hyderabad State with Andhra State. The recommendation was made on the basis that having Hyderabad as a permanent capital would be more suited for Visalandhra, while also giving access to mineral resources, and the large Godavari-Krishna basin under unified control. Paragraph 382 of the State Re-organisation Commission : SRC said “opinion in Andhra is overwhelmingly in favour of the larger unit; public opinion in Telangana has still to crystallize itself. Important leaders of public opinion in Andhra themselves seem to appreciate that the unification of Telangana with Andhra, though desirable, should be based on a voluntary and willing association of the people and that it is primarily for the people of Telangana to take a decision about their future. Nehru on Telangana : Prime minister Jawaharlal Nehru initially was sceptical of merging Telangana with Andhra State, fearing a “tint of expansionist imperialism” in it. He compared the merger to a matrimonial alliance having “provisions for divorce” if the partners in the alliance cannot get on well. Gentlemen’s agreement : The Gentlemen’s agreement of Andhra Pradesh was signed between Telangana and Andhra leaders before the formation of the state ofAndhra Pradesh in 1956. The agreement provided safeguards with the purpose of preventing discrimination against Telangana by the government of Andhra Pradesh. The alleged violations of this agreement are cited as one of the reasons for demands of separate statehood for Telangana. Reason behind Telangana Movement: There was a distinct difference between Andhra and Telangana regions. Since Andhra was part of a colonial Madras Presidency, education levels and development of this region were better than in feudal Telangana. People from Telangana were against merger with Andhra state as they feared they would lose jobs to them. Cultural differences, too, remain even after 60 years of togetherness. Under Nizam’s, and before that, under the Qutb Shahi rule, the culture and language in Telangana bore influences of north India. Emphasis on festivals are also different. With faster development in the rest of Andhra, a strong feeling was gaining ground in Telangana that it was being exploited and that the region’s surplus was being transferred to finance development in the rest of the state. First Telagana Movement (1969) : The first Telangana movement intensified in 1969. Primarily a student-driven protest, it turned historical for the number of people who took part in it. Over 350 students were killed in police firing and lathi charge. Jai Andhra Movement (1972) : Jai Andhra movement is a 1972 political movement in support for the creation of Andhra state.The activists demanded that the safeguards for Telangana region be removed for continuation of Andhra Pradesh. Role of Telangana Rashtra Samithi (TRS) : K Chandrasekhar Rao (KCR), a member of the Telugu Desam Party, quit TDP in 2001 to champion the cause of a separate Telangana state and founded Telangana Rashtra Samithi. Srikrishna Committee (2010) : The report discussed six solutions to the problem. The preferred option was keeping the State united by simultaneously providing certain definite constitutional and statutory measures for socio-economic development and political empowerment of Telangana region through the creation of a statutorily empowered Telangana Regional Council. The second best option was bifurcation of the State into Telangana and Seemandhra as per existing boundaries, with Hyderabad as the capital of Telangana and Seemandhra to have a new capital. Grievances of Telangana proponents : Proponents of a separate Telangana state site perceived injustices in the distribution of water, budget allocations, and jobs. There are allegations that in most years, funds allocated to Telangana were never spent. As per Srikrishna committee on Telangana, since 1956, Telangana held the position of CM for 10.5 years while Seema-Andhra region held it for the rest (47+ years as of 2014), with Rayalaseema region holding the post for 27 years and coastal Andhra representing 20 years. Opposition against formation of separate Telangana State: There was a movement in Seemandhra region opposing the Telangana state formation. Though only an opinion is required under Article 3 of the Indian Constitution, a resolution was adopted by voice vote and the bill was rejected by the Andhra Pradesh Legislative Assembly and Council on 30 January 2014 as the majority of the legislators were from Seemandhra region. Constitutionality on state creation power : According to Article 3 of the Constitution of India, the power to form a new State vests with the Parliament, provided that the Bill creating such a State is introduced on the recommendation of the President and he has referred it to the legislature of the affected State “for expressing its views thereon.” This linear interpretation of the Article would render the view that the Andhra Pradesh Assembly will have no legal effect and the formation of Telangana is solely the prerogative of the Government of India. Important provisions of Telangana Bill : The Bill envisages Hyderabad as the common capital for ten years. The Andhra Pradesh Governor will be Governor for both successor States of Andhra Pradesh and Telangana. The Polavaram Irrigation Project will be declared as a national project and the Center will take under its control the regulation and development and the Tungabhadra Board will continue to monitor the release of water to high level canal, low level canal and Rajolibanda diversion scheme. Six Point development Package : PM had announced 6-Point Package for AP’s Successor States. In a bid to address concerns of the Seemandhra region, government announced grant of special category status including tax incentives to the residuary state as part of the six-point development package. President’s rule : The President signed the proclamation to impose President’s rule in Andhra Pradesh following the Union Cabinet’s recommendation. Mukherjee gave his nod to place under suspended animation the Andhra Pradesh assembly whose term is slated to end on June two. The decision to impose the President’s Rule in Andhra Pradesh was necessitated by N Kiran Kumar Reddy’s resignation as the chief minister on February 19, 2014 as he was opposed to division of the state to carve out Telangana. Politics and Political Parties : Main players in AP are Indian National Congress, Telugu Desam Party, Telangana Rashtra Samithi and YSR Congress. It won’t be the usual Congress versus Telugu Desam Party (TDP) fight anymore as in the united AP. Telangana Rashtra Samithi (TRS) under K Chandrasekhar Rao (KCR) has emerged as the main party of the region, taking credit for the achievement of the new state. Elections in 2014 : Andhra Pradesh will have Lok Sabha and assembly polls as an undivided unit and the candidates elected will automatically become legislators of their respective states after Telangana comes into being on June 2.
potti sreeramulu never asked for Hyderabad state….he wanted a andhra state which was in Madras Presidency i.e., rayalaseema ,coastal andhra not TELANGANA…he died because he resumed his hunger strike as he wanted madras in andhra state…. First SRC recommended not to merge Hyderabad state with Andhra state, but was ignored.